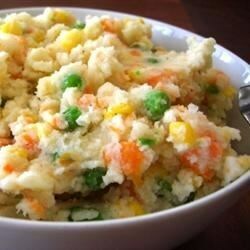 Quick, easy and delicious mashed potatoes with corn and carrots and only 150 calories per serving. Place red potatoes, yellow potatoes, jalapeno pepper, carrots and garlic cloves in a large pot. Cover with water, and bring to a boil over high heat. Cook 15 to 20 minutes, or until potatoes are tender. Drain water from pot. Stir in corn and butter. Mash the mixture with a potato masher until butter is melted and potatoes have reached desired consistency. Mix in cheese, salt, and pepper. Serve hot.